Did You Get Your 2016 1099-R? Our New Tradition – Networking Happy Hours! AFSA continues to emphasize the importance of outreach and public engagement to tell the story of the Foreign Service. There is no better person to tell that story than YOU – the person who devoted his or her career to the profession. We’d like to highlight some individuals who have participated in outreach events in the last few weeks. Retired Foreign Agricultural Service Officer Phil Shull did double duty for AFSA. 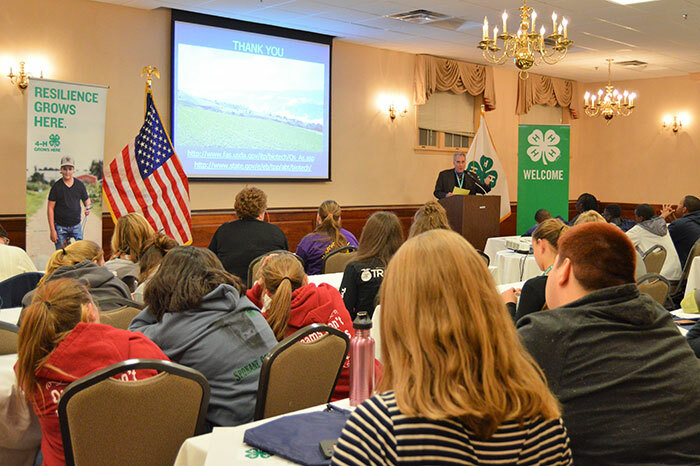 On February 2, Shull gave the keynote address at the 4-H National Youth Summit on Agri-Science. He was later joined by retired USAID FSO Emmy Simmons on the summit’s careers panel. Shull and Simmons discussed possibilities in government and the Foreign Service for young people involved and interested in agriculture. Two retired Foreign Service officers recently met with the Wheaton-Silver Spring, Md., Kiwanis Club. Todd Kushner spoke with them on November 2 about life in the Foreign Service and the role our diplomats play in advancing America’s interests abroad. Then, on December 7, Steve Buck spoke with the same group about his experiences as a Foreign Service officer in the Middle East. In addition, four retired FSOs will speak at the upcoming AFSA/Smithsonian Associates program, “The New Middle East?” The program will take place at AFSA on four consecutive Wednesdays beginning March 15, and will feature Molly Williamson, Dr. Elizabeth Shelton, Ambassador Kenton Keith and Ambassador John Limbert as lecturers. If you are interested in participating in AFSA’s outreach efforts, please join the AFSA Speakers Bureau if you have not done so already. Several retirees already starting on their taxes have asked AFSA why they haven’t received the W-2 for their annuity yet. Technically, for your annuity, it’s a 1099-R, not a W-2. State’s Human Resources Service Center (HRSC) in Charleston confirms that they were mailed out January 31; most annuitants have received them by now. If you haven’t received your 1099-R yet, call HRSC at 1-866-300-7419 and make sure the mailing address they have on record for you is correct. (You can also email HRSC@state.gov, but they’ll only send you an automatic ticket confirming their receipt; the reply can take days more. The “866” number gets you to a real person pretty quickly, and often the whole issue can be resolved in a few minutes.) However, you can also see and print your 1099-R from “Annuitant Express” by going to www.employeeexpress.gov. Unlike a few years ago, you can now get a temporary log-in ID or a password online, provided the email address you provide matches the one on record with the Retirement Accounts Division. There are many benefits to managing your annuity on Annuity Express; printing out your own 1099-R is one of them, and it’s the quickest way to obtain your 1099-R, wherever you are. Read on to learn or confirm how to log on to Annuitant Express. On Thursday, March 2, Ed Zurndorfer of EZ Accounting and Financial Services, an expert on Social Security, will present updated strategies to help you maximize your Social Security benefits. He’ll present from 2:30 to 4:30, but will stay until 5:00 pm for longer Q&A if needed. As reported in the April 2016 AFSA Retiree Newsletter, the Social Security Law of 2015 ended the popular “file and suspend” option which many FS retirees had used to maximize their Social Security benefits as married couples. Essentially, a high-earning spouse could file for their SS benefit when they reached their full retirement age (FRA) and then suspend it, allowing it to grow at 8% each year until it reach “maximum benefit” when they reached age 70. The low-earning spouse could then begin collecting half of the high-earning spouse’s benefit. But April 30, 2016 was the last day one could “file and suspend” to enjoy this method to maximize a couple’s total Social Security benefits, and only if one had reached one’s FRA (at least 66) by that date. Nevertheless, there are still plenty of valuable strategies and tips to help couples maximize their Social Security retirement benefits long term. When is the best time to start Social Security benefits? Is there a “marriage penalty”? Death benefits for survivors? Reasons to suspend benefits even after “file and suspend” has been ended? Maximizing benefits by maximizing earnings? Early collection of widow or widower benefits? Legal protections from creditors? How much of Social Security is taxable? Spousal benefits after divorce? Delayed filing for benefit? The answer to these and other questions will help you develop the best Social Security strategy for you and your family. Read on to get a taste, with ten suggestions for federal employees to get the most out of their Social Security retirement benefits. We also welcome you to attend Ed Zurndorfer’s March 2 presentation; as always, members who are not able to attend may view it online! Please register for event by clicking here or emailing events@afsa.org. Candidates for AFSA’s 2017-2019 Governing Board were announced on February 15. Retiree members may vote for the officer positions (president, treasurer, secretary) as well as the retiree vice president and two retiree constituency representatives. Please visit www.afsa.org/elections for information on the candidates as well as election procedures and deadlines. A town hall meeting will take place on April 4 at 12 p.m. at the AFSA headquarters building, 2101 E St NW, Washington DC 20037. The event will be taped and made available on the AFSA website at www.afsa.org/video. Retired AFSA members are welcome to attend our new discussion series on professional issues. The first four events will take place in February and March. February 17: Why Is Dissent Important? These will be brown bag events, taking place at AFSA headquarters, 2101 E St NW. Click here for additional information on these events and for registration instructions. Retired members should have received a copy of AFSA’s 2017 Directory of Retired Members in early January. This edition includes names and contact information for nearly 4,000 of your colleagues. It also has updated contact information for retiree resources, survivor annuity elections, former spouse benefits, Medicare, FEHB, and a new article on assistance after retirement. If you did NOT receive the directory, please let us know so that we can ensure we have your correct address. Any address changes can be sent to our Member Services department by clicking here. If you have yet to take the plunge into AFSA’s online community, now is an ideal time to do so. It is more active than ever, and discussions topics range from dissent to immigration policy. We encourage you to visit www.afsa.org/community and get ready to exchange ideas and views with your friends and former colleagues. Remember that this is an internal online social community, just for AFSA members. Please drop by AFSA’s next networking happy hour on February 16, 2017—TODAY!—to catch up with old friends, connect with new colleagues, and share stories and survival tips with fellow members of the FS family. Non-alcoholic beverages and light snacks will be served; $3 drink tickets for wine and beer will also be available. You may register online or email events@afsa.org. AFSA members should always feel free to be in touch with our Retiree Counselor Todd Thurwachter, who is available by email at retiree@afsa.org or by phone at (202) 944-5509.